MCA members can take pride in the contributions they and their association have made to the community for over sixty years. Members and staff serve on not-for-profit boards, and contribute generously of their time, talent and money. But it is as an organization that its greatest impact is felt. The MCA has provided entire plumbing and heating systems for several Habitat for Humanity homes, bathrooms for boys' group homes, furnace and boiler checkups through its HEAT'S ON program for the elderly, and is the in-house plumber for the Food Bank. In the past, the MCA co-sponsored Summer Jobs for Youth, helping to find meaningful first jobs for over 250 of Westchester's neediest teens. In addition, the MCA has donated the proceeds of its annual golf outings to The Anthony Senerchia Jr. ALS Charitable Foundation, Hospice & Palliative Care of Westchester, American Cancer Society, National Multiple Sclerosis Society, Intrepid Fallen Heroes Fund, Blythedale Children’s Hospital, Make-A-Wish Foundation, Guiding Eyes for the Blind, Food Banks of Westchester and Hudson Valley, Lustgarten Foundation, Danny Fund and Friends of Jaclyn Foundation. When the price of home heating oil skyrocketed in 2007, the MCA gave $25,000 to the Westchester and Putnam Community Action Program to help the homeowners in need. As one member said, "As long as there is need in our community we will be there to give back". 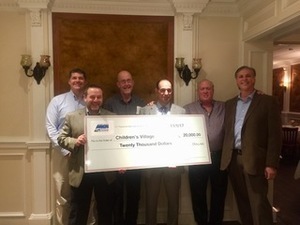 This is the thirteenth year that the MCA has donated the proceeds of its golf outing to charitable organizations with a presence in the Hudson Valley. This years donation brings the total to $313,000. The Children’s Village of Dobbs Ferry’s mission is to work in partnership with families to help society’s most vulnerable children so that they become educationally proficient, economically productive and socially responsible members of their communities. Behind this mission lie three core beliefs: First, all children and youth need connections to adults, preferably family members, who believe in them and will remain connected throughout their lives. Second, education, appropriate social behavior, and job skills are essential to functioning independently in society. Third, everyone has strengths and the desire to make his or her life happy and fulfilling; with support and the tools to overcome obstacles, most can and will succeed.